I am so giddy with excitement to finally get to share details about this quilt and project with you that I don’t quite know where to start. I suppose the best place would be with an amazing photograph, right?? 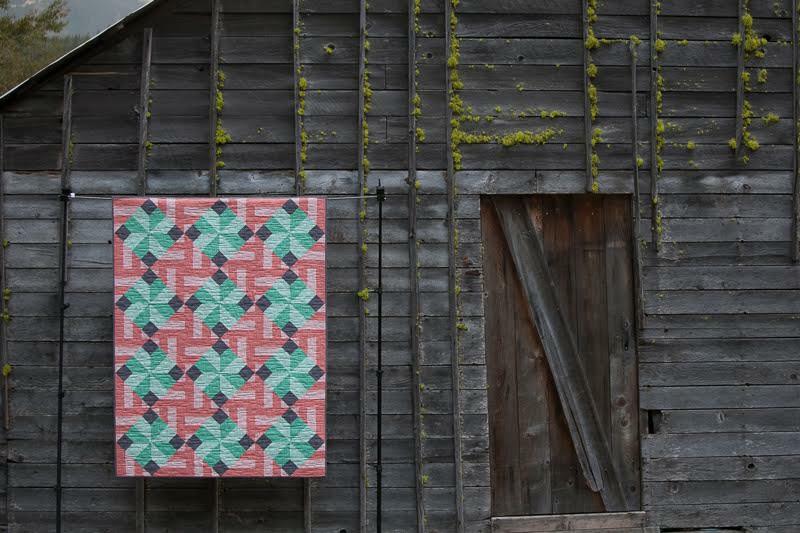 I would like to introduce you to Tiled Parquet, my quilt pattern for the debut pattern collection of Quilt Theory. 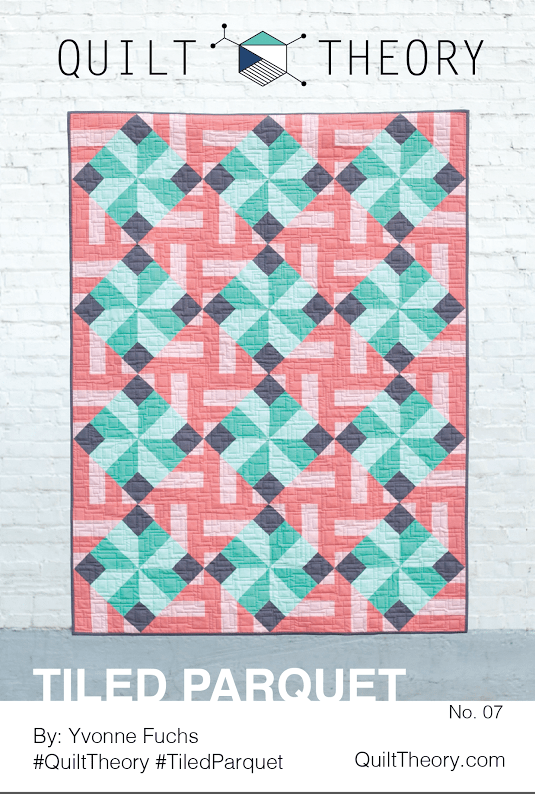 Quilt Theory is a a new pattern company created by seven modern quilters who have teamed up to create a new line of gorgeous modern quilt patterns that anyone can make. Printed on 4×6 cards or handy one-page PDFs ready for printing, these lap-sized quilt patterns are sure to inspire. Tiled Parquet is a design that I created earlier this summer when I was brainstorming pattern options for a good friend. I was given an inspiration color palette and ended up making Flight Path, but this design and color palette stuck with me: I really wanted to see it through. What speaks to me the most about the Tiled Parquet design is the X block pattern that is created… with a twist. The design creates a fun swirling pattern in the background, and with tonal fabric selection has a very 3D effect. 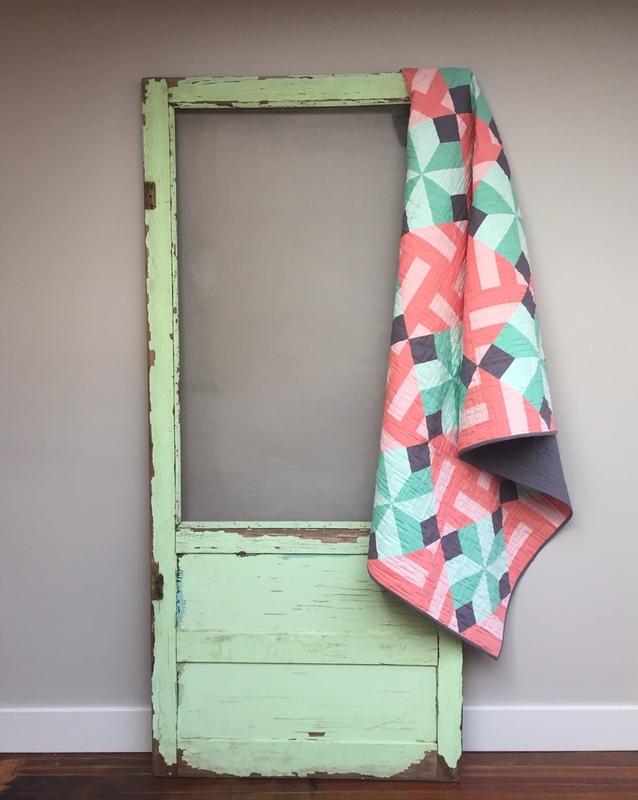 Beyond being a fun visual design, the pattern also reminds me of a wooden parquet floor of a home from my youth, so seeing Michelle’s beautifully staged photos of my quilt in rustic settings is really taking me back to some great childhood memories! Tiled Parquet finishes at 48″ by 64″, a great lap size or throw quilt. Many thanks to Robert Kaufman Fabrics for providing the Kona Cotton for the Tiled Parquet quilt (Salmon, Peach, Aloe, Ice Frappe, and Coal) and to Aurifil for supplying the thread behind the quilting magic. All Quilt Theory designs are available now as downloadable PDFs through our website QuiltTheory.com. Pattern cards coming soon to a local quilt shop near you! Let your local quilt shop know you want them to carry Quilt Theory patterns. 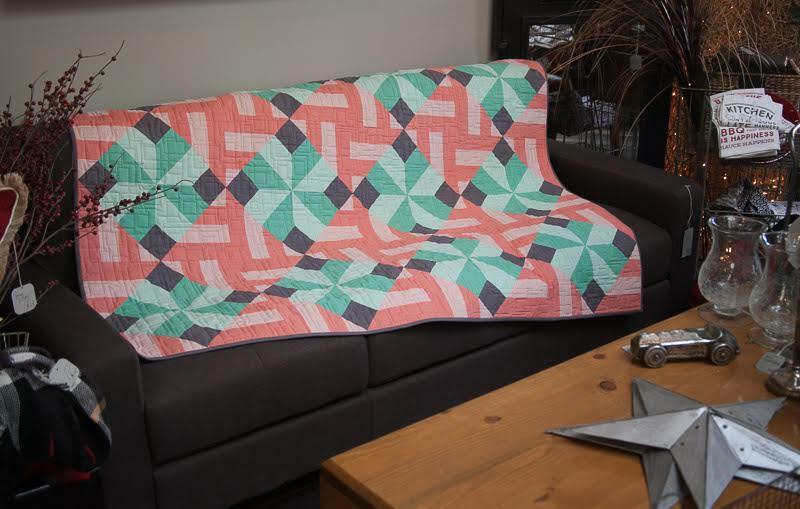 Each Quilt Theory design is simple to execute, yet engaging enough for advanced quilters. Our eye-catching designs bring new life to traditional quilt methods and aim to inspire. 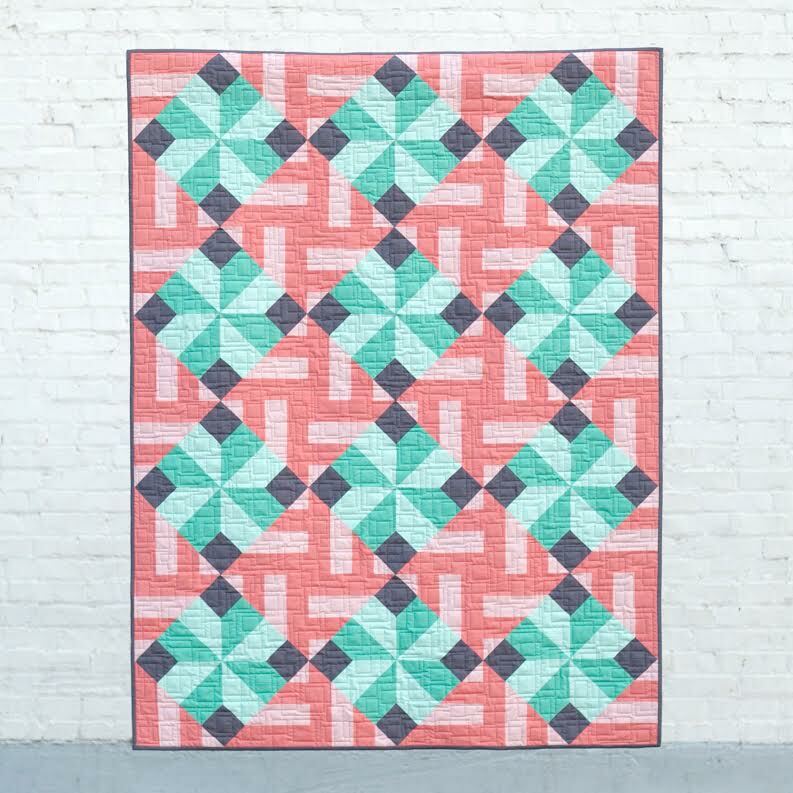 To get more details about the debut Quilt Theory pattern collection, be sure to follow along with the Release Blog Hop Schedule! To celebrate the launch of Quilt Theory, I am giving away a printed copy of my pattern, Tiled Parquet along with a PDF of all of the Quilt Theory Coloring Pages. To sweeten the deal, I’ll also include a $25 gift certificate to Stash Fabrics. Linking up with Finish it Friday, TGIFF, Can I Get a Whoop Whoop, and Main Crush Monday. Your quilt, the others in Quilt Theory.com, and the photography!!! I can truly appreciate the time and thought Michelle has put into the photo shoots, the settings and locations. Superb quilts, and I am amazed and astonished all over again at your patterns and quilting with everything else you do!!! 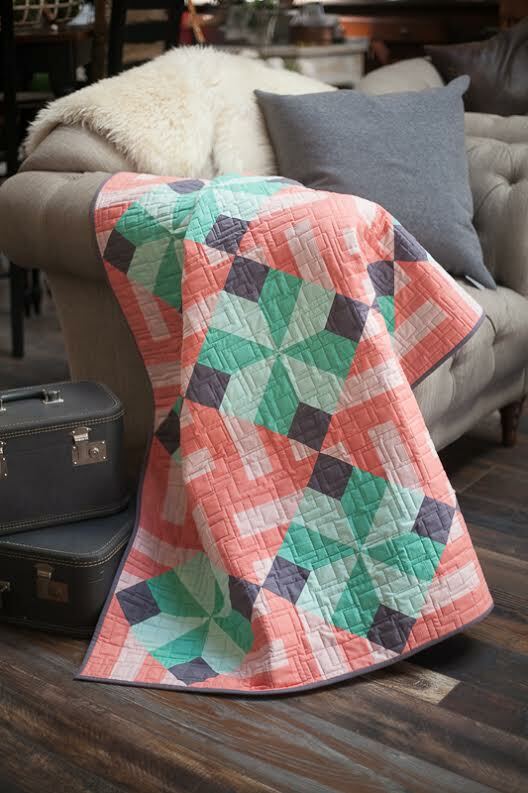 Love the colour combo in your quilt, soft and gentle with just enough brights there too. Your quilt is beautiful! The link to the raffle copter isn’t working! I am so sorry about that; it is fixed and working now. Your designs are so clever Yvonne. They always look very simple and clean, but are actually very sophisticated. Good luck with the new venture – it sounds like an excellent idea. The power of friends and teamwork! Yay! Rafflecopter stats the give away has not started. This quilt is beautiful. I love the colors and the spinning effect. I plan to get the whole pack of patterns. Thanks for sharing your work with us. Congratulations on the launch of your new pattern as well as your new endeavor. I read about it yesterday, and it’s an awesome group of quilters. Best wishes for a most successful venture! I really like your pattern and the 3D effects it makes. This is a beauty! It reads ‘parquet’ floor to me too! I love the colors you used, they make the design of the blocks pop! Gorgeous photos too! Congratulations on a great quilt and your new pattern venture! Best wishes with the launch. Its gorgeous. Can’t wait to see how these patterns work! Always looking for good ones to teach new students! Yvonne, you are a genius and always a source of inspiration! What a fabulous design and one that will great in so many color combinations. I’d love to make one in Christmas colors for my holiday crashing on the couch! Congrats! Well congratulations! That’s really cool and I like your design alot. It really does pack a punch! Congrats on a great quilt design. When I look at this quilt I see big pin wheel candy suckers from years ago. Lots of movement. Your new quilt is fantastic! Congrats on the pattern release! It is a lovely quilt. I just love the little visual swirl it creates. Congratulations on your new endeavour. I’ve looked at the pattern page and the patterns are so reasonably priced and the designs are definitely eye catching. I always look forward to your new quilts and the way you interpret color. Hope to see the cards in stores here. This is a really attractive pattern! What a great design and a great new undertaking! This is a wonderful pattern and your finished quilt is just gorgeous. This definitely meets the criteria of “eye catching design”! Truly beautiful quilt Yvonne. The pictures are fantastic, too! When looking at Michelle’s picture of Tiled Parquet from a distance, it has a totally different effect – up close tile, further away pinwheel. Love the movement! Congrats Yvonne! What a great design and love the color combo. You all make a great team! Such a great design, I love the movement! Great quilt, Yvonne! Well done on joining forces to become a pattern company. Great branding up front and good products should make this venture successful. I hope so anyway! This is such a fun and creative endeavor! So happy for you all…amd of course, all the rest of us too:) this is a very cool design! Beautiful finished quilt! Good luck with your new pattern company! I love this design, Yvonne — the sense of movement you’ve created is fabulous. Best wishes on Quilt Theory! I look forward to seeing what the group of you design! Woohoo! These photos are fantastic, she picked so many great locations. I love the quilting you chose, the squares work so well with the triangles in the piecing! So excited to see where this new adventure takes you and your quilt patterns! Congrats on another great pattern release! I love the idea of having an entire pattern fit on a small card. That would make things so much easier, if you are traveling and working on your project. These photos are pronominal. Those beautiful colors pop in each picture. Congratulations on your new group and new pattern. Love those Kona colours. Good luck. What a fun pattern idea. This is a great design and your fabric choices do make it seem 3D. I definitely love the movement in this quilt. I think all of the patterns from the Quilt Theory collaboration are wonderful. Love this pattern Yvonne and the colours you have used. I have just cut into my FQ of Ice Frappe and now think I may get some Aloe to team up with it aswell. Michelle makes great pics! You all done good job with your patterns! Well done! What a beautiful quilt! Congratulations Yvonne! The idea to start this company is a great one and really, unlike any other. PS – I also meant to say that Michelle’s photos are stunning!